Dinner doesn’t get more basic than roasted chicken with potatoes and a green vegetable. Today’s unrecipe lets you make the entire meal all in one pan. It doesn’t get much simpler than that! The chicken is roasted to perfection, yielding crisp skin and tender, juicy meat. The potatoes take on extra flavor from the chicken drippings, with a crusty outside and a fluffy interior. The asparagus gets tossed in during the last 15 minutes of cooking time, to keep it al dente. Add some lemon and a little garlic and dijon mustard and you have the making of a mouth watering feast. Your dinner partners will thank you for the delicous meal. You’ll thank us for only having to wash one pan. It’s a winner of a chicken dinner for all involved! Layer the potatoes in the bottom of the roasting pan, and toss with olive oil and a little salt. If they are larger potatoes, cut them into chunks. We used tiny little fingerlings, and left them whole. Season the chicken with salt and pepper, garlic, dijon mustard and a little olive oil. Massage the mixture onto both sides of the chicken and place it on top of the potatoes. Tuck a few lemon slices in amongst the chicken pieces, and roast at 400 degrees for about 30 minutes until the potatoes start to brown and the chicken skin is nice and crispy. 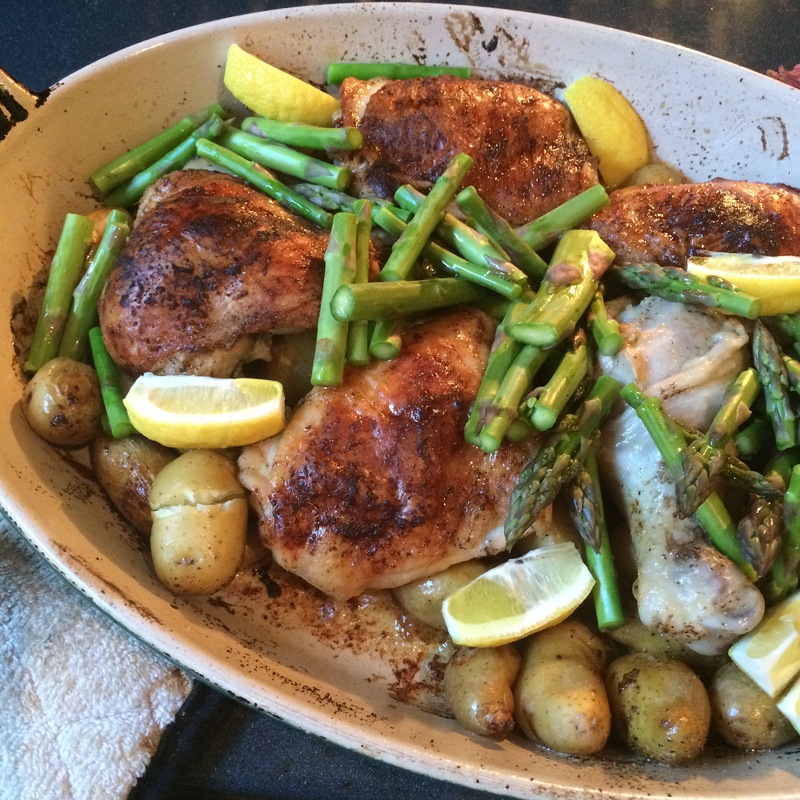 Toss in the , trimmed and cut into 3″ pieces, and continue to cook until the asparagus starts to soften, but is still crisp, and the chicken and potatoes are fully cooked, about 15 minutes more. Remove from the oven and enjoy! In the spirit of a true Unrecipe, you can use any type of potato, and most any green vegetable. Try Idaho, red russet or even sweet potatoes, cut up. Toss in green beans, broccoli or zucchini spears instead of asparagus. Add a some olives, or artichoke hearts. Why not stretch your creativity a bit. It’s only on pan. Isn’t it funny how once the weather changes, my palatte changes with it? I suddenly can’t get enough tomatoes, corn, basil and zucchini. My spiralizer becomes my best friend, allowing me to morph a zucchini into noodles with the quick turn of a handle. Two minutes in a pan and I have a tasty base that gets me past my pasta craving most days. Except yesterday. I made homemade fettuccine in the late afternoon, and tucked it away until dinner time. The dough gave me a run for my money…it was too dry, so I added a little olive oil and water and kneaded it into submission. When I started to put it through the pasta machine (the old fashioned hand crank type is all I use,) I felt like something magical had happened. The dough reacted perfectly, and didn’t require untangling or adding flour to prevent the cut pasta from sticking together. After 2 or 3 minutes in boiling salty water, I had a big bowl of the lightest, most delicate fettuccine I had ever made. It easily held its own against the fresh pastas I have had in fine restaurants here or in Italy. I had to give in and taste it. Don’t let people trick you into believing that fresh pasta is always superior to the dried varieties. 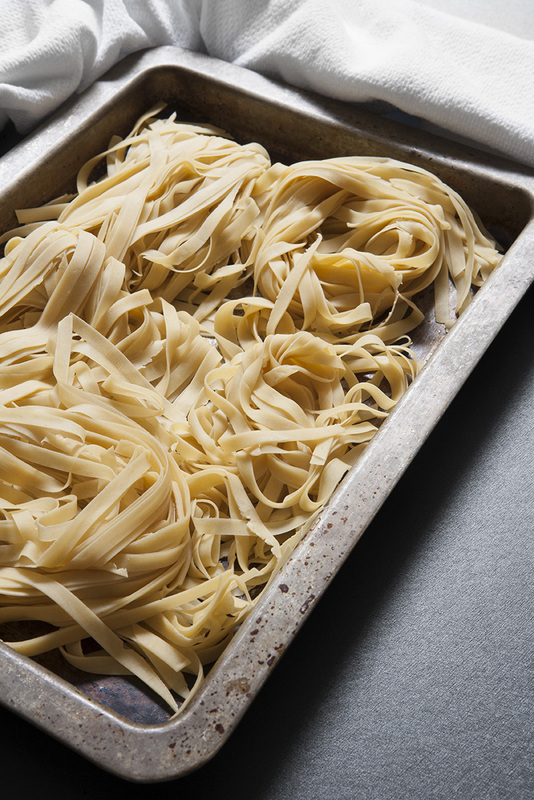 Fresh pasta is more delicate, and takes to simpler, oil based sauces. The dried types do the heavy lifting, and should be used for tomato sauces, especially those with meat, which could overpower many freshly made pastas. I tossed ours in a garlic and basil puree with lots of parmesan cheese and topped it off with my latest obsession, oven roasted cherry tomatoes. They become so sweet they are like eating candy. This dinner is so simple to make that you can prepare the components and go sit around and relax until dinner time. At least that is what I did. If you can’t get fresh pasta (many stores carry it in the refrigerator case ) and don’t feel like making your own, it will still be good with the boxed kind. 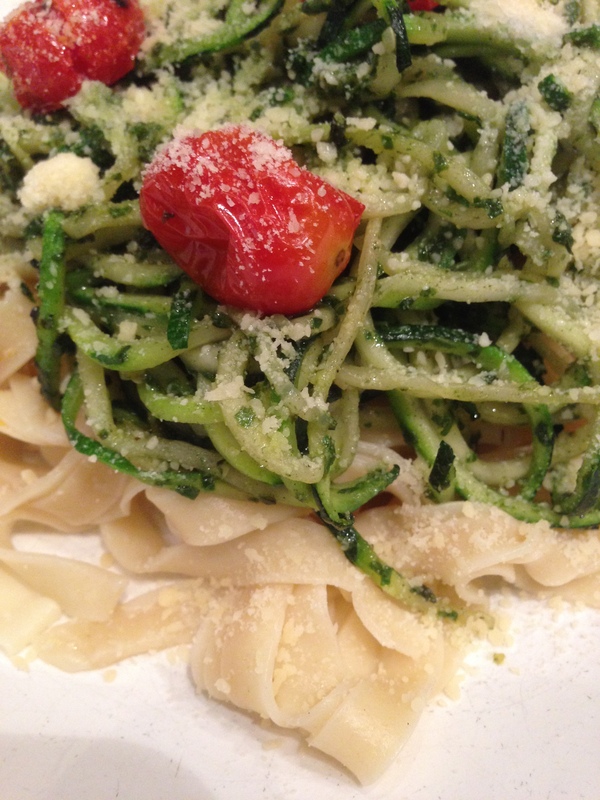 If you don’t have a spiralizer, use a vegetable peeler to shave your zucchinni into ribbons. If you don’t have a food processor, use a blender, or buy a bottle of pesto sauce. The beauty of an unrecipe is keeping it simple and making it your own. Do roast the tomatoes though. Its totally worth the minimal effort. Rinse and dry a pint of cherry or grape tomatoes. Toss them in a little olive oil, sprinkle them with sea salt and pepper, and spread them on a cookie sheet lined with parchment paper. Pop them into a 400 degree oven for about 25 minutes or until they are starting to caramelize, but not burnt or dehydrated. Turn the pan about half way through and give it a shake to ensure more even cooking. You can also sprinkle some dried or fresh herbs, such as basil or oregano on them before roasting. 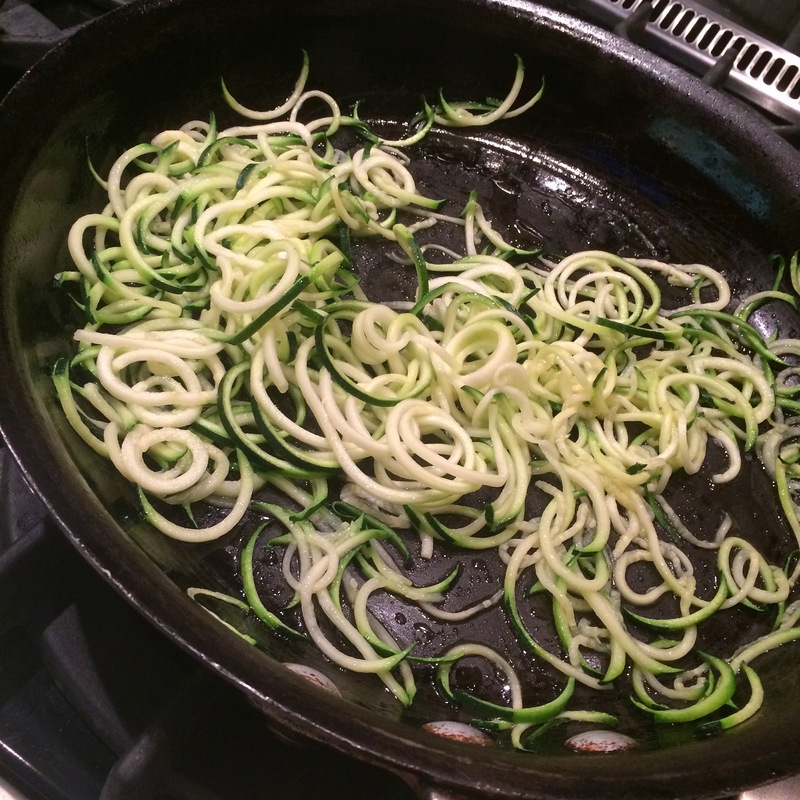 Spiralized Zucchini Noodles aka Zoodles! Saute the zucchini noodles in a little olive oil until starting to soften, about 1 or 2 minutes. Add the pureed basil oil and mix well. If it is a little thick, add a few spoonfuls of the pasta cooking water to thin it down. Cook the pasta according to directions, or about 2-3 minutes if homemade, and drain. Place the pasta in a bowl. Spoon the zucchini on top, and sprinkle liberally with parmesan cheese. Place the oven roasted tomatoes on top, and enjoy!!! On a summer evening, we’re looking for a meal that has it all: bountiful seasonal produce, great flavors and textures, and one that won’t leave us feeling overly full. When it doesn’t involve too much slaving over a hot stove, or heating up the house with the oven, it’s an added bonus. Saturday night’s dinner fit the bill. 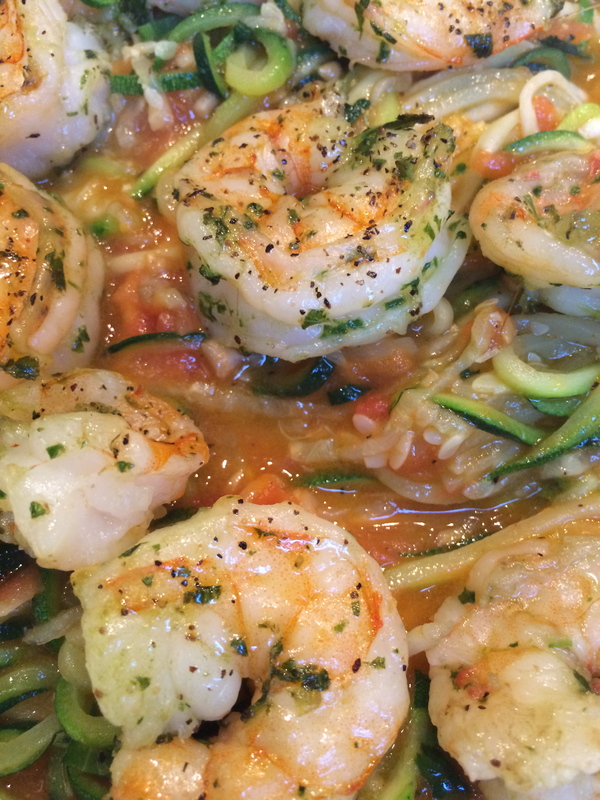 Using zucchini as a base, with ripe tomatoes and fresh basil blanketing fresh Florida shrimp, it was as tasty as it was easy to prepare. 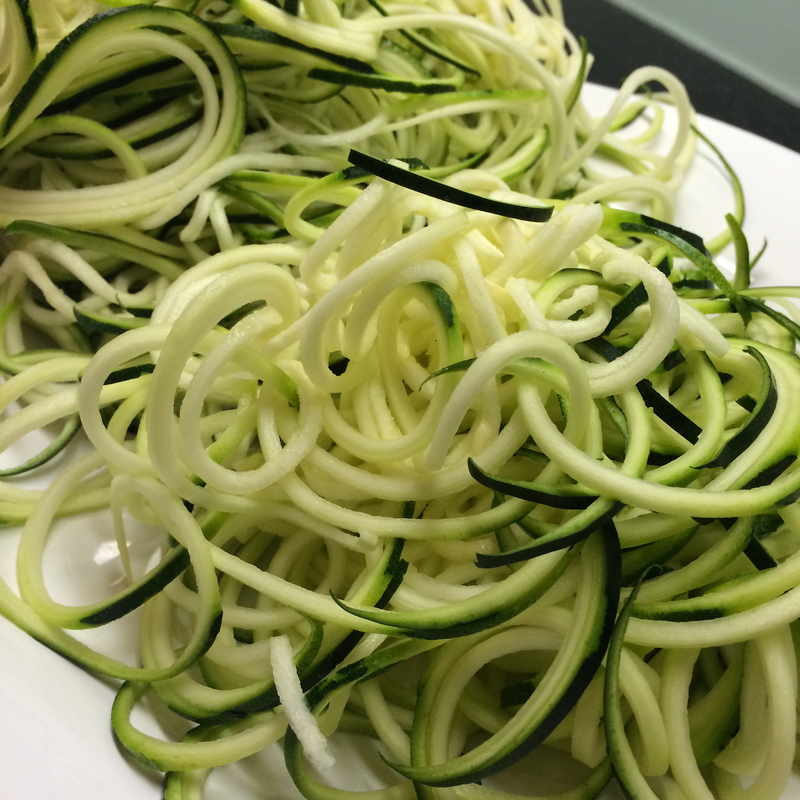 Using a spiralizer, cut 2 zucchini into noodles and set aside. Saute 2 cloves of garlic in olive oil. Add fresh tomatoes ( I prefer them peeled, but it isn’t necessary) cut into chunks, and a few fresh basil leaves. 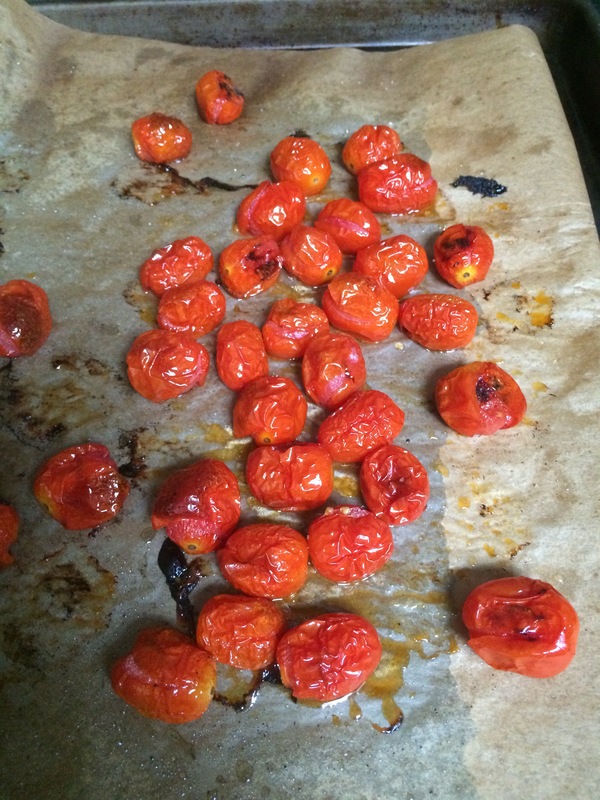 Season with salt and black pepper, and cook on a low heat until the tomatoes start to melt. 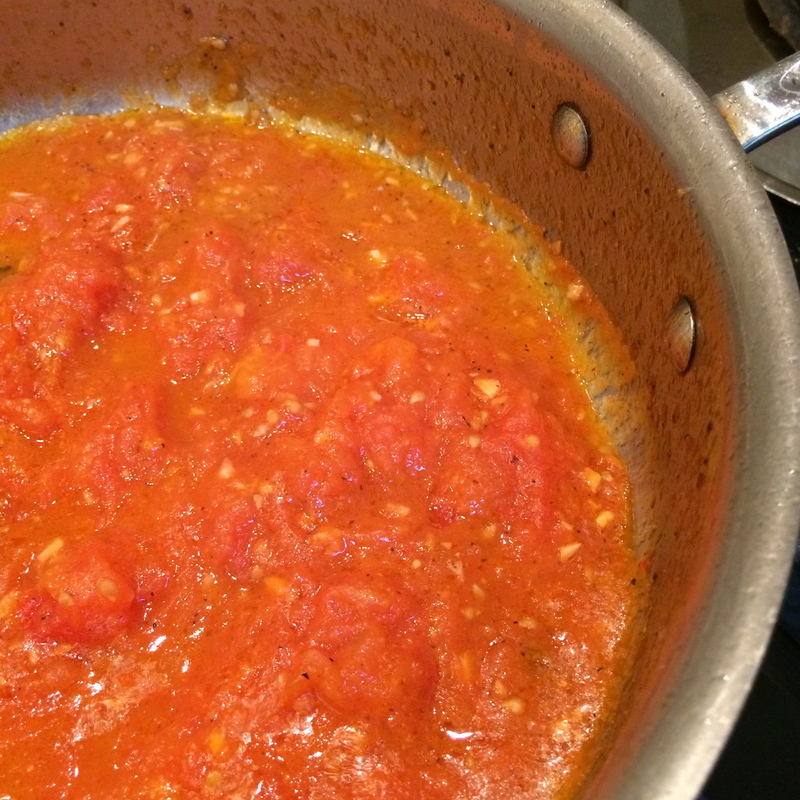 Stir often until it is the consistency of a thick, chunky sauce. Add the zucchini noodles, and cook, tossing, for just a couple of minutes until the zucchini is cooked, but still crisp, and completely covered in the tomato sauce. Peel and devein the shrimp. Spread out on towels after rinsing to eliminate any extra moisture. In the meantime, place a clove or two of garlic and a large handful of basil leaves into the work bowl of a food processor or blender and process until it is finely minced. 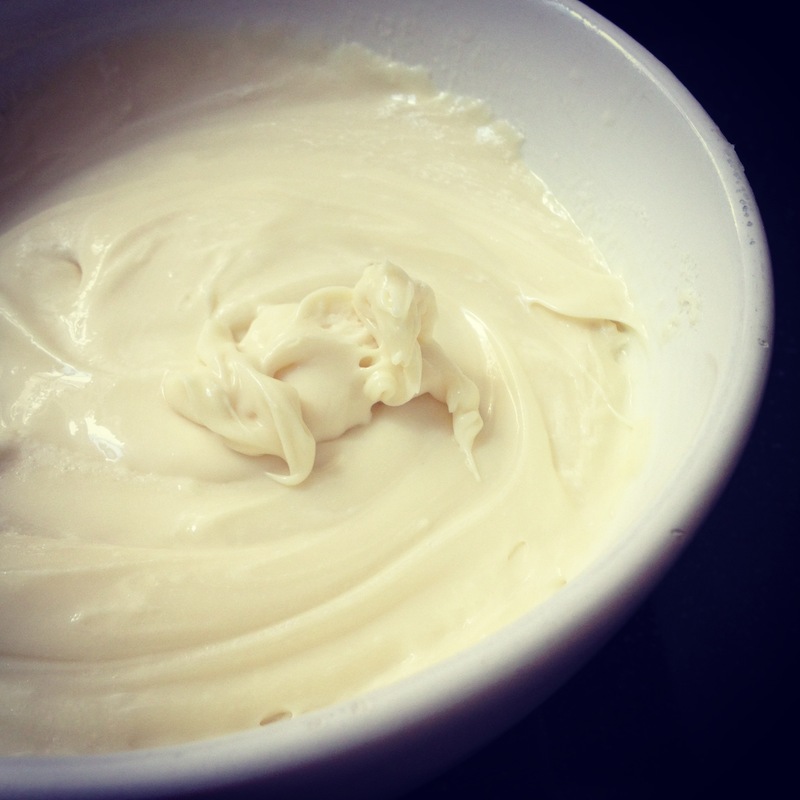 With the machine running, drizzle in olive oil until the mixture emulsifies. Place the shrimp on a cookie sheet, and brush them with the basil mixture. Sprinkle with salt and pepper and broil or grill them for a couple of minutes until pink and opaque. Conversely, they can be sautéed in olive oil, adding the basil mixture at the end and coating the shrimp thoroughly. Add them to the zucchini noodle mixture and toss. Serve in shallow bowls and enjoy! We are on the home stretch of Thanksgiving planning, and after a whirlwind month of working, I finally got around to taking my own advice and made my Thanksgiving game plan. Using mostly tried and true recipes, which are contemporary twists on traditional fare, here is my menu:Many of these recipes have been posted before, so just click on the link to take you there! For a tutorial on making the perfect pie crust, click here. Stay tuned this week, as we countdown the days until Thanksgiving, with cooking tips and recipes for the big day. Here is a light, summery variation on tacos. They are simple and healthy, and rely on fresh, zesty flavors, rather than the heavy beans, sour cream and cheese often found in the meat variety. The fish is marinated, and they are served with a simple slaw and diced vegetables. A typical “unrecipe”, they are easily customizable to suit your tastes. 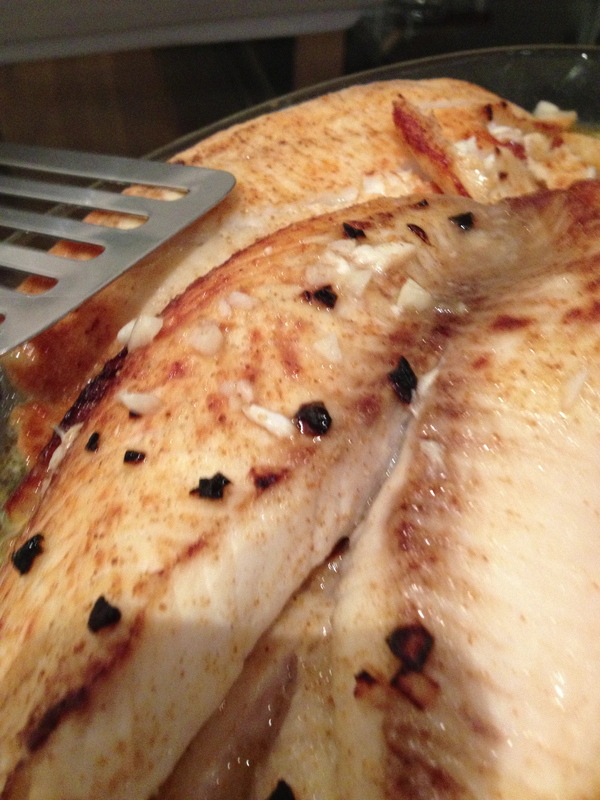 Marinate any white fish (Cod, flounder or tilapia for example. I used tilapia ) in the juice of 2-3 limes, a tablespoon or two of oil, a clove of garlic finely chopped, and cumin, cayenne pepper, salt and black pepper to taste. Coat the fish and allow it to marinate in the refrigerator for at least 15 minutes, or up to an hour or two. 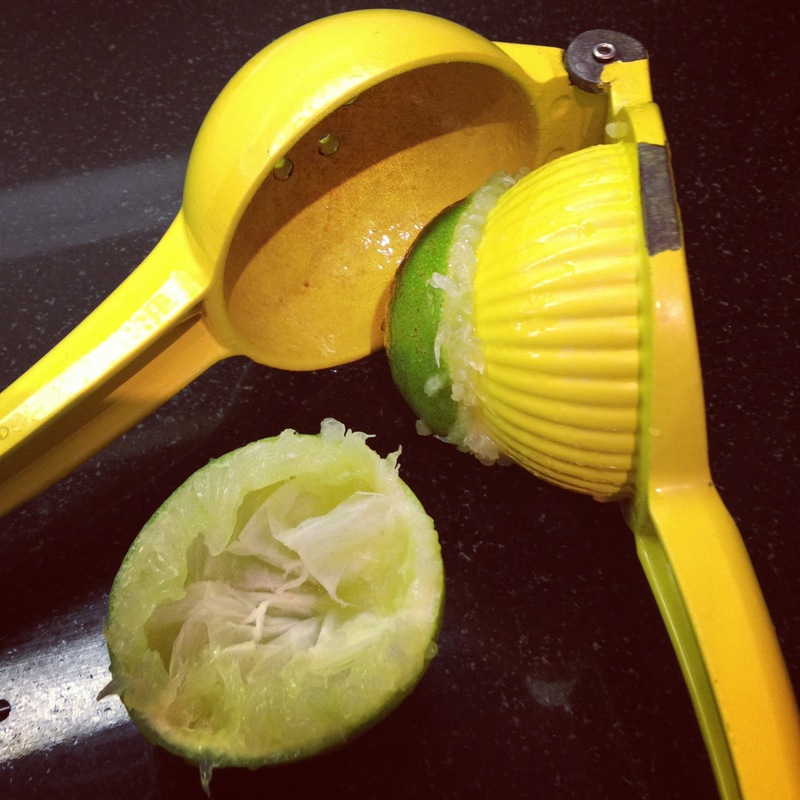 If you try to marinate it too long, the citrus may cause it fall apart. Grill or broil the fish until cooked through. Set aside. Finely shred 1 napa cabbage and chop a big handful of cilantro. Toss with a little lime juice and olive oil and season with salt and pepper. You can add a bit of chopped red onion to the slaw, but I chose to serve them on the side, since I dislike raw onions so much! 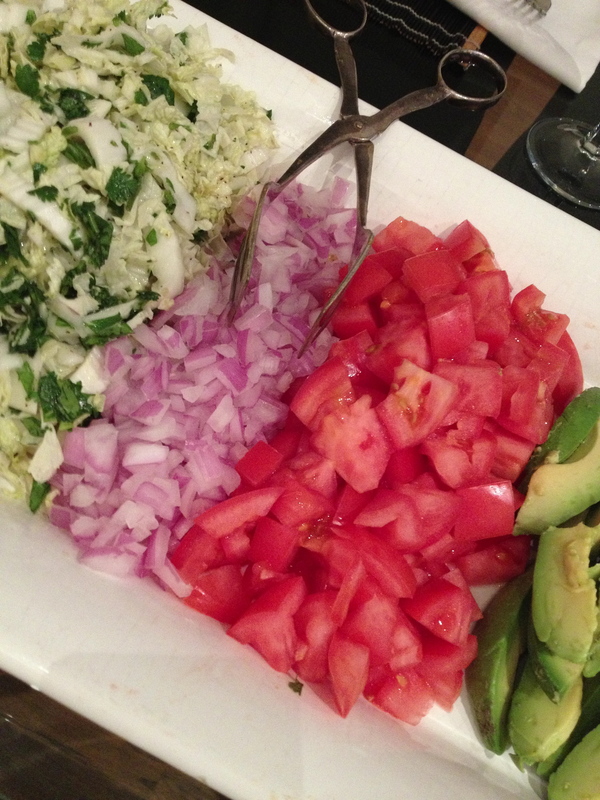 Dice avocado, and fresh tomatoes for additional fillings, or use guacamole and salsa if you prefer. Heat flour or soft corn tortillas and cover with a kitchen towel to keep warm. 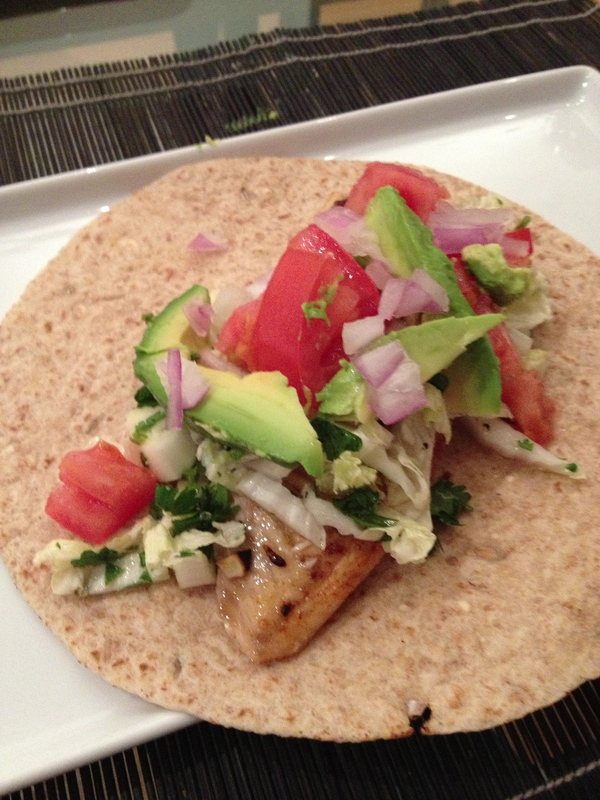 Place a piece of the fish on the taco, add some slaw, and avocado, and tomatoes, sprinkle it with a little hot sauce, roll it up, and enjoy!! The highlight of our meal was someone seeing these shots on instagram, and running over to join us for dinner! Like us on Facebook, follow us on Twitter, Tumblr ,instagram and Pinterest too! It was Father’s Day, and bandaged hand or not, I wanted to make a special dinner to celebrate. I usually shy away from fried foods…partially because of the health aspect, but more because of the mess. I have a commercial stove and even vigorously boiling water leaves spatters. The kitchen is open to the rest of our loft, and the thought of all of my guests hanging out in the kitchen while I hover over a pan of sizzling hot oil doesn’t sound like my idea of a good time. Tonight however, I persevered. 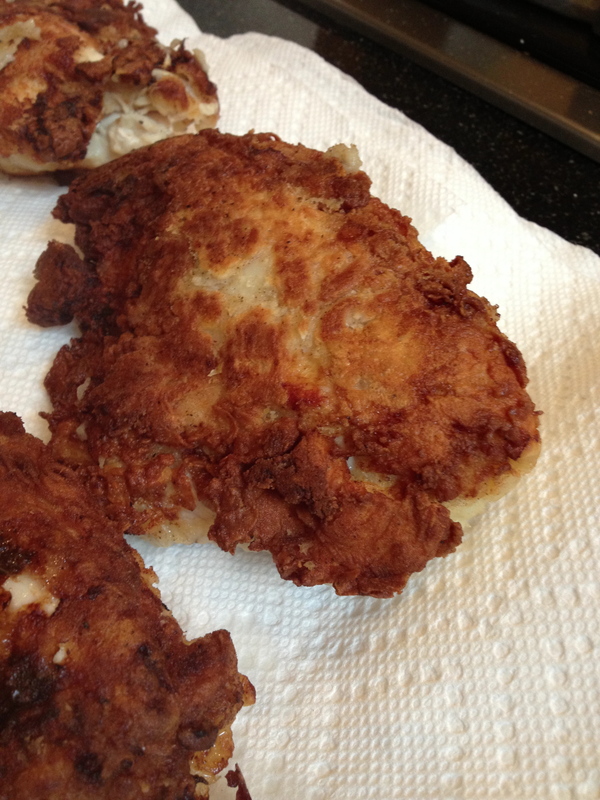 I poked around on all of my favorite websites, looking for tips for the perfect fried chicken. Soaking overnight in buttermilk seemed to be a commonality. 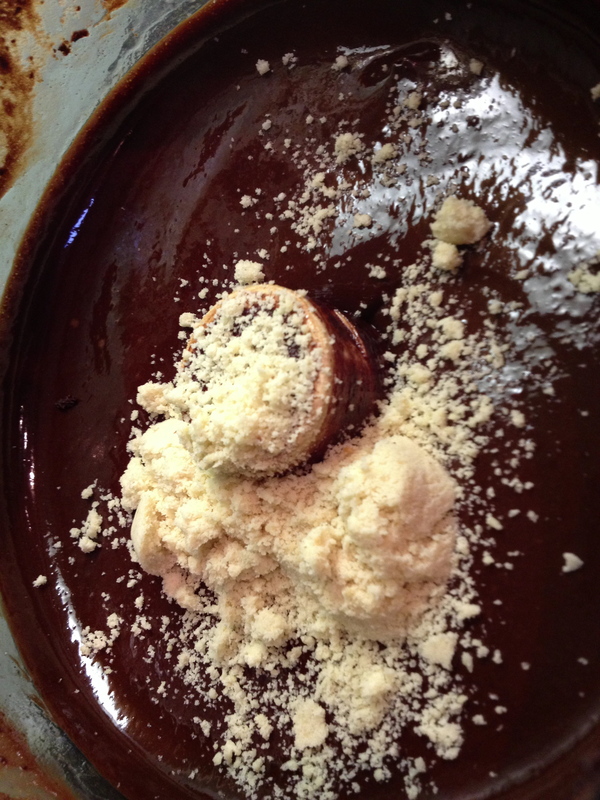 Many recommended adding a little baking powder to the flour mixture for a little extra crunch. Given my recent run of mishaps, most of my Facebook friends suggested ordering out, or baking it in the oven to avoid another trip to the burn unit. Instead, I donned gloves, put on an apron and some sleeves, and went for it. Soak the chicken for several hours, or overnight in buttermilk, liberally seasoned with some salt and pepper. Prior to frying, roll the chicken pieces, still coated in buttermilk, in a large bowl of flour, seasoned with salt, pepper, a tablespoon or so of baking powder, garlic powder,paprika and cayenne pepper to taste. Lay the chicken pieces out on a parchment or waxed paper covered baking sheet and return to the refrigerator until ready to be fried. Place about 1” of vegetable oil in a large pan. The higher the sides of the pan, the less spattering there will be. Heat the oil to about 375 degrees and add the chicken, skin side down. Work in batches, and leave ample room between the pieces. Cook covered for about 7 minutes. Turn the chicken pieces and cook uncovered for about 7 minutes. The time will vary depending on the size of the pieces. You want to cook it through, but avoid burning the outside. The drumsticks cooked faster than the breasts due to size, but generally dark meat takes a little longer than white. Drain on paper towels. 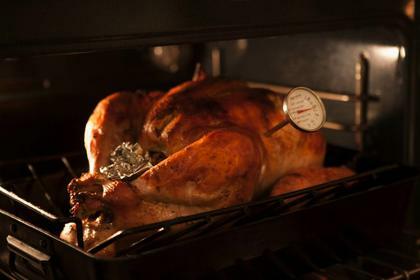 Transfer the cooked pieces to a rack placed on top of a baking sheet, and place it in the oven to keep warm. The rack allows air to circulate and keeps the chicken crispy. If you are unsure if the chicken is cooked through, leave it in the oven to finish cooking. 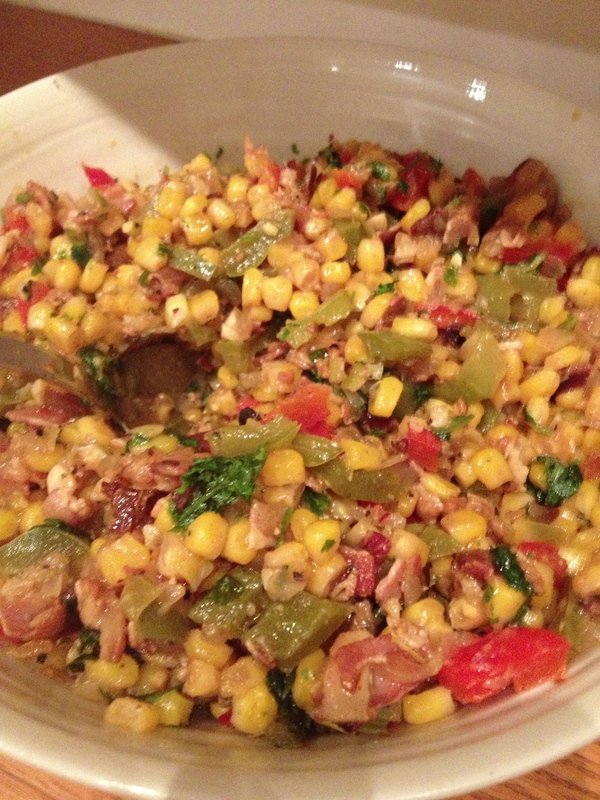 I served ours with sweet and spicy corn salsa with pancetta, previously posted here. I haven’t been posting many (un) recipes lately. I have been busy with work and other commitments, and I have been falling back on my old standbys rather than creating new ones. This weekend, I was committed to trying something different. We had a violent storm rip through the city on Saturday afternoon, and when the thunder, lightening and torrential rains subsided, I headed out pick up some ingredients for dinner. I ran into a friend along the way, who decided to accompany me on a trip through Chelsea Market, making the journey much more fun. Inspired by a recipe from Andrew Carmellini, I began foraging through the market. First stop, the newly renovated Lobster Place. Oh how I missed my fabulous seafood market during the several months they were closed! It has finally reopened, with an expanded space, immense selection and an attached restaurant. It was there that I picked up fresh cod filets, cleaned squid and a small bottle of clam juice. Next stop: The Manhattan Fruit Exchange for fresh produce. I added a red bell pepper, a bunch of basil and some baby arugula to my stash, and moved on. My final stop was Rana, where I bought some homemade fettuccini to use as a base for my concoction. In a large sauté pan, (with a lid) sauté some thinly sliced garlic in olive oil. Add a red bell pepper sliced into thin strips. Toss in some hot red pepper flakes, and add about a ½ cup of dry white wine. Bring it to a boil and add about a cup of clam juice and 2 cups of marinara sauce. At this point, it’s ok to use a simple marinara sauce from a jar if you don’t want to take the time to prepare your own. Season the cod filets with salt and pepper and place them in the sauté pan. Pour the tomato broth over the fish, cover it, and cook it in a 375-degree oven for about 12 minutes or so. When the fish is done, carefully remove it from the pan, and set aside, covering it to keep warm. Return the pan to the stove, and add the calamari (squid) cut into rings.. Simmer lightly for 2 or 3 minutes until they are fully cooked. Avoid boiling them, as they will get rubbery. Add some chopped basil and arugula to the pan and mix thoroughly. To serve: Place the cooked fettuccini into pasta bowls. Place a fish filet on top of the pasta, and pour a generous amount of the sauce and calamari over the fish. Make sure you have a spoon, or a big piece of crusty bread on hand, because you will want to lap up every last bit of that rich, spicy sauce! Remember, this is an unrecipe. If you can’t find fresh calamari, try rock shrimp, bay scallops or clams instead. Or be adventurous, and use a little of each! Even simpler, just cook the fish and use the flavorful sauce on it’s own, without the added seafood. It will still be delicious! If you choose to use a bottled sauce, you may need to adjust your seasonings a bit. 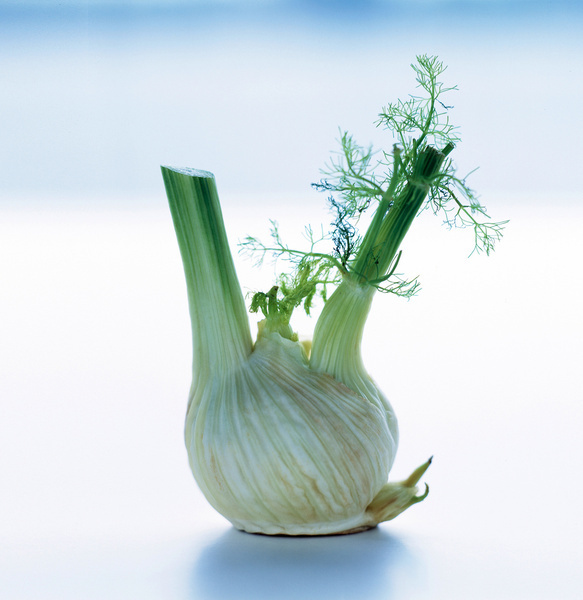 If the sauce already has a lot of garlic, you may not want to add anymore at all. * Be careful when blending hot liquids! Place a kitchen towel over the top of the blender, and use a few cautious pulses to get started. You only need to experience the explosion of scalding hot liquids when the top blows off the blender once, to learn to practice caution. Tonight we are celebrating “Easter-over” a hybrid of Easter, Passover and a celebration of spring. It’s an opportunity to indulge in the flavors and traditions of the holidays, and the diversity of the guests. The rules are simple: it’s my made up holiday,and it’s appropriate to serve anything I feel like making, within the confines of the season and the holidays. That could mean matzoh balls and pork chops, or gefilte fish and fried chicken, but it’s not either one of those. This year, I have mixed it up, and for those of you who follow us on Facebook, or Instagram, you have been getting hints of things to come. 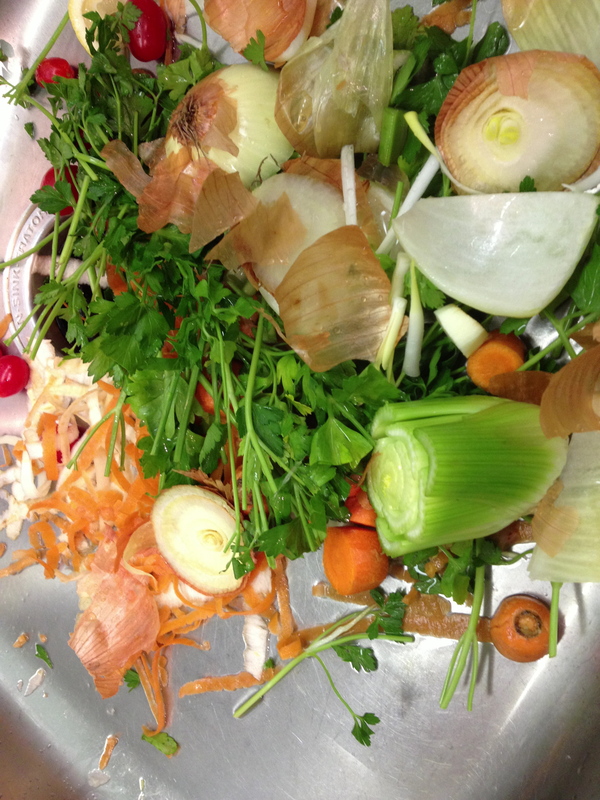 A beautiful mess of food scraps. What were they from? 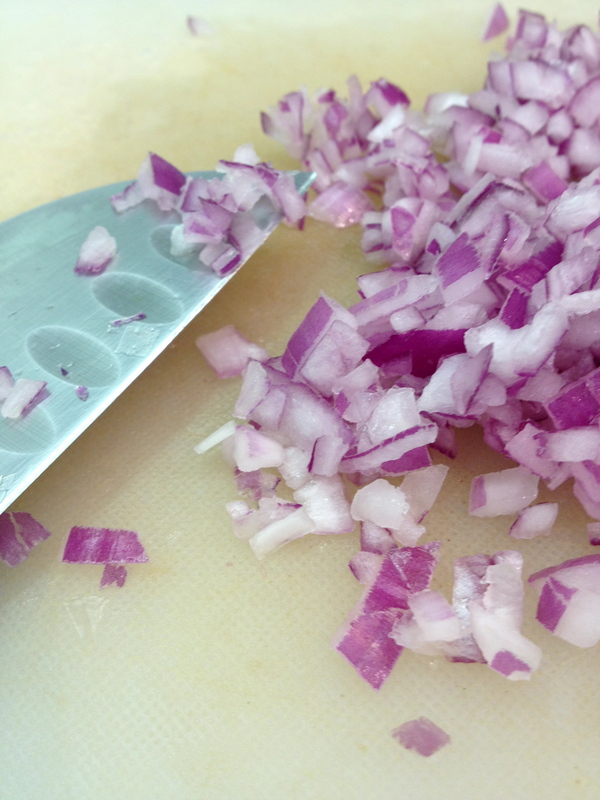 Personally, I loathe raw, red onions, and will surgically remove them from my food if they are there. 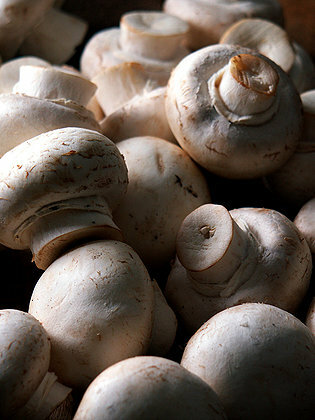 Sometimes, a recipe really needs a little jolt, and these do the job well. They look pretty, don’t they? 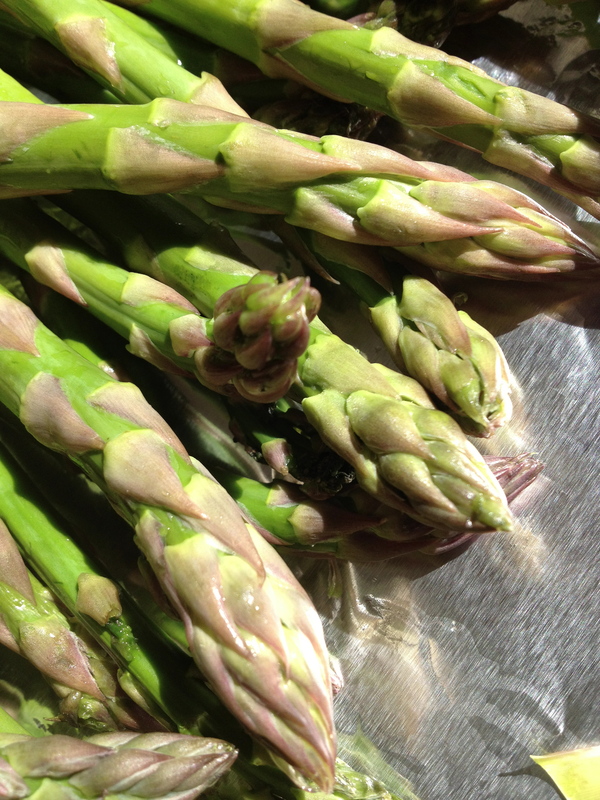 Nothing says spring like daffodils and asparagus! 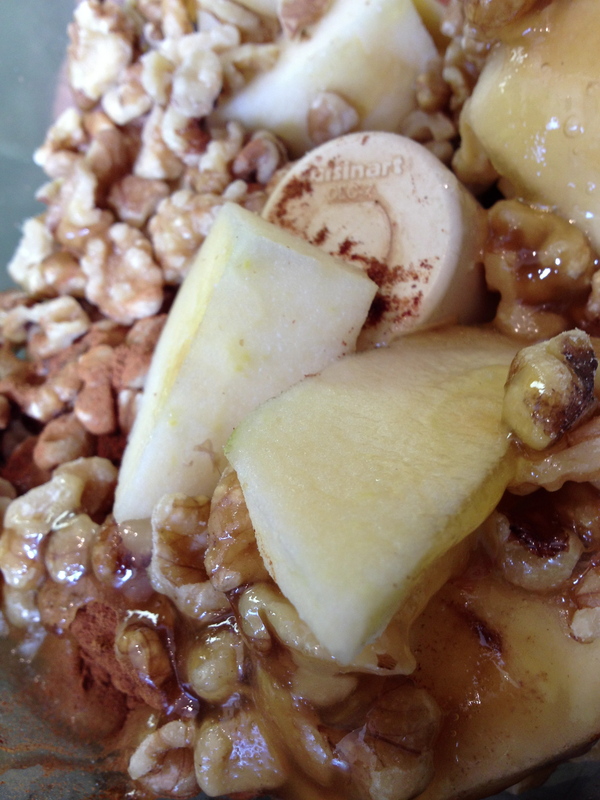 Apples, walnuts, honey, cinnamon….what could this be? Yum,chocolate! That’s a little almond flour you see. This one just happens to be gluten free and passover approved! Spring lamb is synonymous with the season. This one has a rosemary,garlic coating to keep it moist and flavorful. 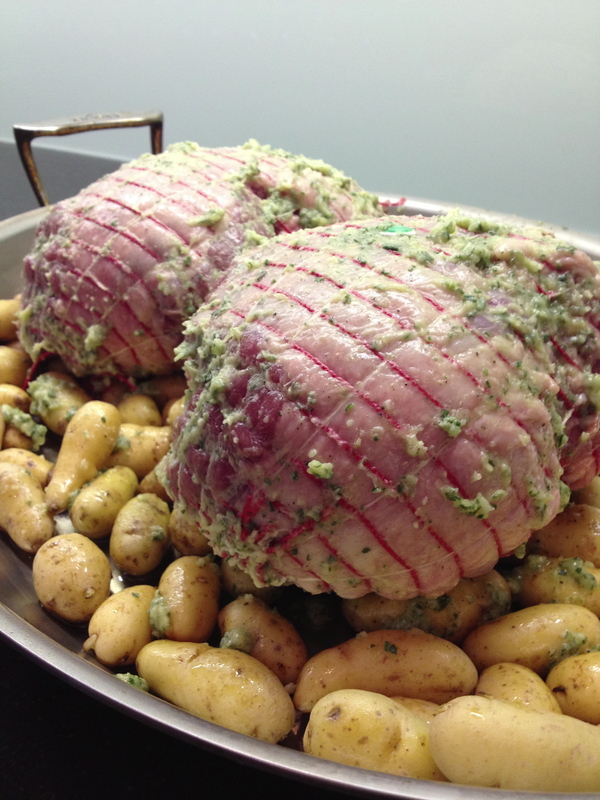 The meat is sitting on a bed of baby fingerling potatoes, which should get crisp and tender as the lamb cooks. Did we get you hungry yet? If you’re in the neighborhood, dinner is at 7!